Achoo! Last week, I began writing an article about how to protect your family from the flu. Ironically, that very day before I finished writing, I began experiencing flu-like symptoms. How could that be? I wash my hands so frequently the skin is cracked in several places. Hand-washing, isn’t the only way to protect your family against the flu, but it is one of the most important. Below are tips that can help protect your family against this season’s flu outbreak, which is now well underway. Avoid touching your mouth, nose, and eyes. Touching an infected person or item and then putting your hands on these areas is a sure fire way to spread the infection. Cover up! 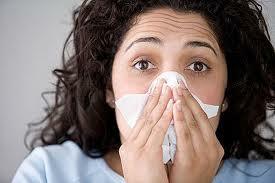 The flu virus can be easily spread by infected persons who cough and sneeze without covering up, so protect yourself. 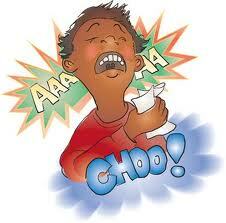 Turn your head, cover your mouth and nose, and wash your hands, if possible, when someone near you sneezes or coughs. Better safe than sick! Get the flu shot. Although it’s late January, it is still not too late to get the flu vaccine. It is also now easier than ever with most pharmacies offering them at low cost and with no appointment necessary. Limit close contact with those infected. I know this is easier said than done, since infected persons may not exhibit symptoms the first day or so. It’s even more difficult to stay away when someone in your household is infected and relying on you for care. Wearing latex gloves and using disinfectant wipes can help prevent the spread of flu between your sick loved ones and their caretakers. So you’ve done everything you could to protect yourself and you still end up with the flu. Now what? Drink plenty of broth and tea. These are great ways to get extra fluids and lower your body’s temperature. While drinking something hot may not seem logical when your temperature is already high, it does help to promote healing. The heat from these hot drinks causes perspiration, which works to lower your temperature and soothe your sore throat. Herbal and decaf teas work best, so stay away from caffeinated drinks and they dehydrate the body. Drink plenty of electrolyte-rich fluids. If you’re having bouts of vomiting and diarrhea, replenish lost electrolytes with drinks such as Powerade and Gatorade. Use steam baths to aide in decongestion. These can be purchased at most grocers and pharmacies for under $20. You can also achieve the steam bath effect by turning your shower water to the highest temperature, closing the bathroom door, and inhaling and exhaling deeply to clear the lungs. Be careful to limit your time in the steam to no more than 10 minutes to avoid exhaustion. Get lots of rest. Remember that it takes at least two weeks to fully recover from the flu, but your recovery may take longer if you do not get enough rest when the symptoms first hit. Let’s chat and share your home remedies.